Valentine’s Day is upon us and while I’m not all that into flowers and dinner that come with inflated prices, I am partial to clothes with hearts on. Burberry has run with this trend over the past six months with both their men and women’s lines – yes Harry Styles is a fan – now it’s time to see what shows in the past week have been offering up some more affordable heart adorned alternatives. The Carrie Diaries celebrated Valentine’s Day last week (the season finale is January 31 hence why it’s this early) in an episode that broke several hearts. Carrie had a terrible night out after getting into a fight with Sebastian and this was followed by a revelation that devastated her BFF Walt. 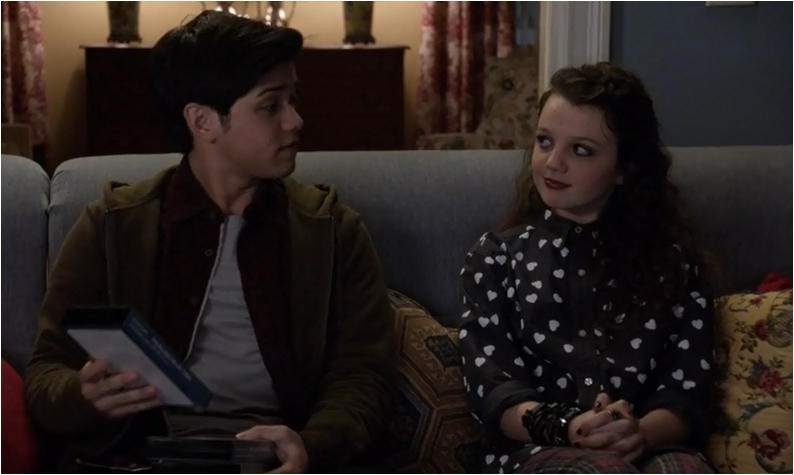 While it didn’t end in a good place for Walt, Carrie and Sebastian made up and it’s a good job considering Carrie is wearing a super cute sweater covered in hearts from Oasis. This wouldn’t be a good break up look, well unless Carrie wants to go DIY again with some nail polish and this is too adorable to ruin. Meanwhile the other less cutesy Bradshaw sister is also trying out the hearts trend, in black of course and paired with tartan pants in an attempt to make it a tad punk. There are several variations of this shirt available from the Harry Styles favored Burberry, Marc by Marc Jacobs with contrasting white collar or this one from New Look which is a fraction of the cost. For the reverse here’s the C. Wonder blouse that Mindy wore on the most recent Mindy Project. While not as ubiquitous as polka dots, there is a lot of variety when it comes to the symbol of love. It’s not just shows set in the ’80s with a penchant for hearts and on this week’s Trophy Wife Hillary is wearing a grey sweater with mint green and light grey hearts from Keds. And it’s not even Valentine’s Day. Unlike certain festive themed sweaters, hearts can be worn all year without looking out of place; both alternative kids like Dorrit and more girly girls like Carrie and Hillary can embrace this trend.